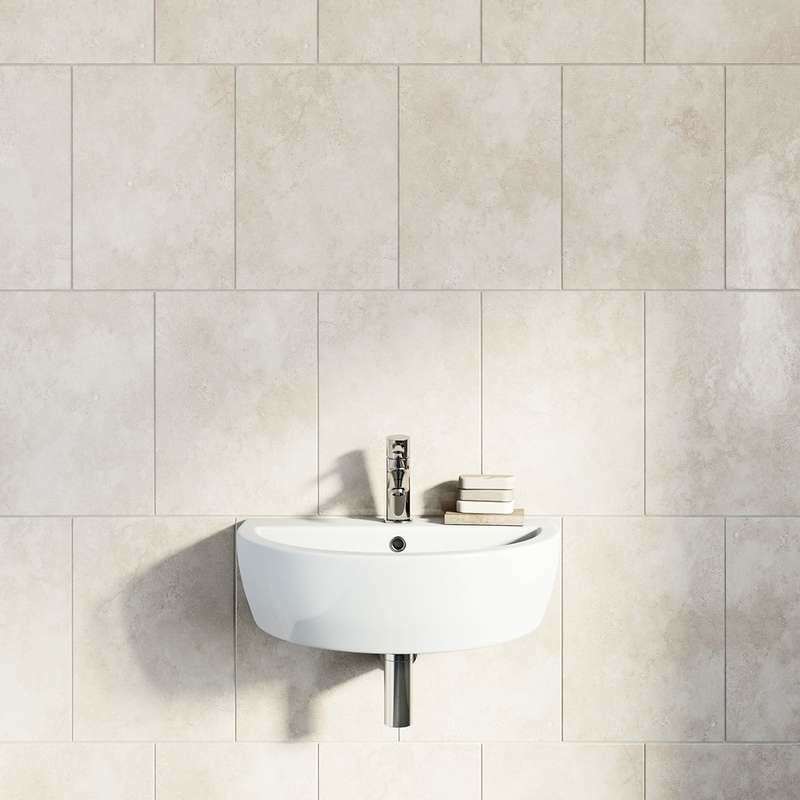 Tiles are the foundations upon which many great bathrooms are built, so it’s vitally important you get this bit right. Here at VictoriaPlum.com we’re dedicated to helping you build the perfect bathroom, so here are our tips for bathroom tiles. Bathroom tiles don’t come in a one-size-fits-all, so you need to choose the size carefully. Large tiles generally open a space up but you may find that small [mosaic tiles] are great at enhancing some areas when used in the right colour combinations. Measure your space carefully and consider which size tile would look best. Consider whether you intend to cover every wall or just a particular section, and whether or not you intend to opt for a tiled floor. White is the classic choice for bathroom tiles but you certainly don’t have to stick with this throughout. While an entire wall of coloured tiles may be too much in some rooms, interspersing coloured tiles or a [decorative border tile] with the standard white option is a great way to add interest to a room. If white isn’t your thing, there are plenty of softer colours such as beige, sand, bone and grey which work very well with the white of a bathroom suite. These come in a variety of finishes including stone and wood effect. Block colours are best used in small doses so if you want to limit your use of white as much as possible then go for small arrangements of soft colours in key places – such as above the washbasin. This is an ideal spot for a mosaic pattern which can add colour without being too bold. If you feel white is simply too clinical, why not opt for stone effect tiles? 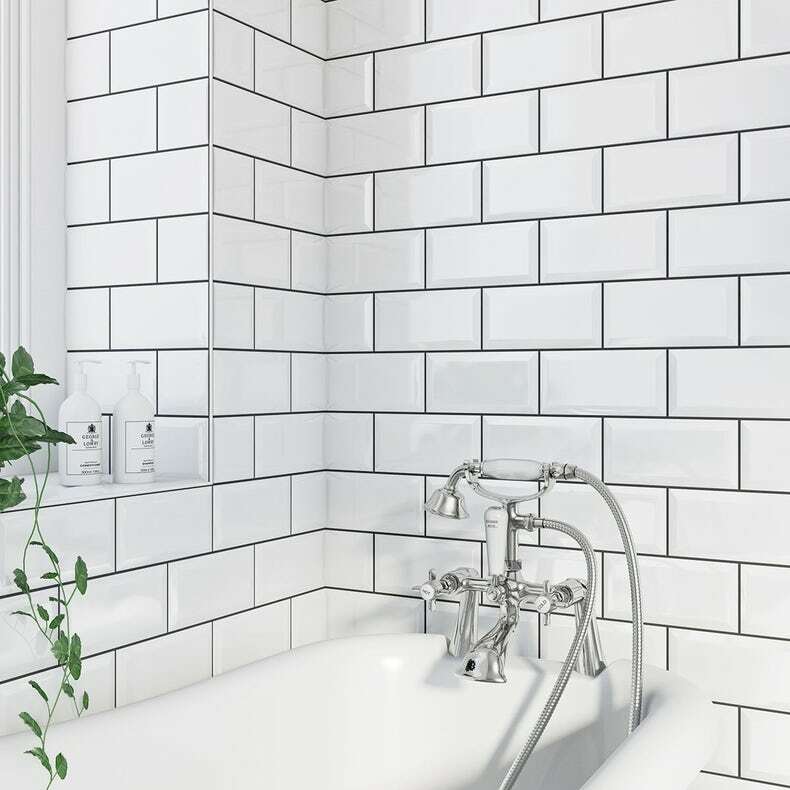 Traditionally tiles are used on the walls surrounding wash basins, showers and baths to combat splashback, but some people choose to go all the way and cover every available [wall surface in tiles]. This is entirely down to you but remember to consider the size of your room carefully. At VictoriaPlum.com, you’ll find a handy tile calculator on every individual tile page, allowing you to quickly and easily work out how many tiles you’ll need. If you have a self-contained shower cubicle like one of our shower cabins then you may not have to use as many tiles on the walls but what about your flooring? Bathroom tiles are just as suitable for this area, but other waterproof options like laminate or vinyl flooring can be used instead if you’re after something a little cheaper but with the same benefits and conveniences. Are you fitting the tiles yourself? Make sure you have all of the essential tiling accessories, such as adhesive, tile spacers, tile cutter, tools and, of course, not forgetting a tape measure. You need to make sure bathroom tiles are fitted correctly to create a watertight seal. You should plot the tiling on the wall first to act as a guide before attaching a long, flat strip of wood or metal to the wall for support. Then apply adhesive to the wall before affixing the tiles, using spacers to create a smooth and even result. See our how to tile guide for step-by-step instructions and handy videos. If you lack confidence then using a professional tile fitter may be worth the extra expense.